King County Parks and the City of Sammamish are taking immediate action to protect and restore the kokanee salmon population and will replace three culverts on Zackuse Creek this summer. The new culverts will provide access to over a mile of upstream spawning habitat for the kokanee and other fish species. Safety is King County’s top priority during trail construction. Due to the type of construction activities, narrow corridor, steep terrain and limited access, the trail will be closed from the north side of the intersection of Shore Lane NE and East Lake Sammamish Parkway at 611 E Lake Sammamish Shore Lane NE, south to the intersection of Shore Lane NE and East Lake Sammamish Parkway at 125 E Lake Sammamish Parkway SE. 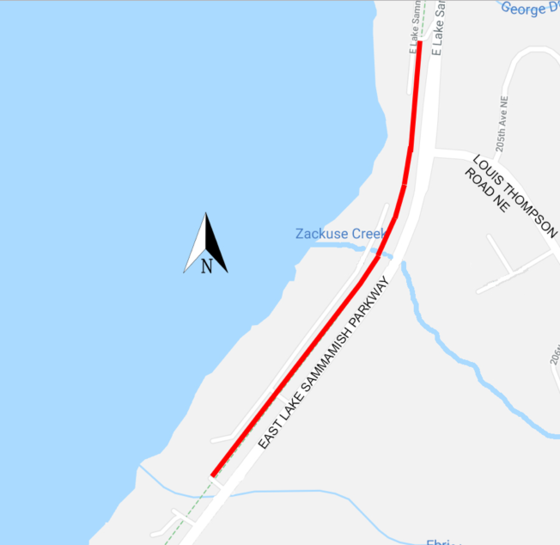 On July 30th, this short segment of the East Lake Sammamish Trail will be closed and considered a construction zone for approximately 30 days. Trail users will be able to enter and exit the trail from or to East Lake Sammamish Parkway at 611 E. Lake Sammamish Shore Lane NE, and 125 E. Lake Sammamish Parkway SE.